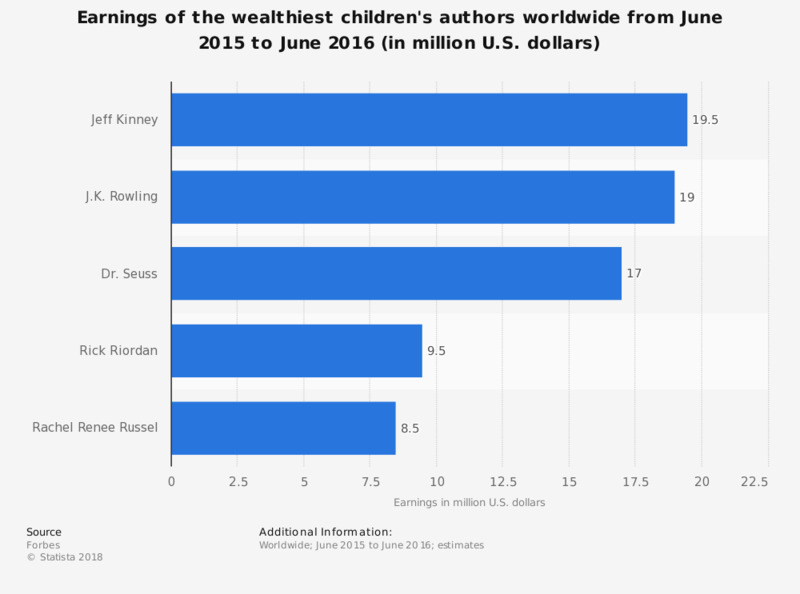 The statistic shows a ranking of the highest paid children's authors worldwide. In the period from June 2015 to June 2016, Jeff Kinney - author of the 'Diary of a Wimpy Kid' series - was the wealthiest children's author worldwide, with earnings amounting to 19.5 million U.S. dollars. The source provides the following explanation about the methodology: "estimates are compiled by examining print, ebook and audiobook sales from Nielsen BookScan figures, considering TV and movie earnings and talking to authors, agents, publishers and other experts. Earnings are tabulated from June 2015 to June 2016 and are pretax; other fees are not deducted."